Below find expanded information about the above mentioned service types. Worn, dirty movements can be given new life. We offer a professional and complete overhaul of your clock movement. For an in depth look at what is involved go to our Clock Movement Restoration page. Although it is easier to list what we do not repair we hate to start with a negative. Floor clocks of all sizes and brands, new or old; Howard Miller, Sligh, Ridgeway, Colonial, Gazo, Emperor, Pearl, Ethan Allen, Baldwin, Bulova, Piper, King Arthur, Dold, Hermle, Keininger, Comitti of London including English and American Bell Strikers and Herschede, Colonial, Winterhalder, Elliot, Elite, Jacques, etc. tubular bell grandfather clocks. We repair key wound Anniversary clocks, Cuckoo Clocks of all types (movements by Regula and Hubert Herr to name the most common modern versions), Jewelers Regulators, Railroad Regulators, Vienna Regulators, Crystal Regulators, Morbiers, Flat Tops, Schoolhouse, Tambours, Kitchen, Ogee, Half Column, Full Column, Triple Deckers, Steeple, Beehive, Acorn, Figurals, Ship’s Bell clocks by Chelsea and Boston and clocks with wooden movements. Early American manufacturers include but are not limited to; Ansonia, New Haven, Welch, Waterbury, Seth Thomas, Sessions, Ingraham, Gilbert, Ithaca, Southern, Howard, Kroeber, Russell and Jones and Terry to name but a few. As far as electric clocks go we repair <?xml:namespace prefix = st1 />Revere and General Electric chime and strike clocks as well as some Seth Thomas electric clocks. Most time only electric wall clocks are repairable or can be converted. Generally speaking we do not repair time pieces that can be held in the palm of your hand like watches and travel clocks or other bed-side alarm clocks, including digital clocks or clock radios. I also limit myself to only a few types of electric chiming or striking clocks. Many electric clock motors are no longer available although some of them can be rebuilt (see above). Most battery operated Anniversary clocks are not reasonably repairable. When possible it is best to return them to the manufacturer for movement replacement. In some cases when the pendulum doesn’t rotate but the clock works fine, we are able to repair it for you. Mike considers house calls one of his specialties. He estimates that he has made over 18,500 in home service visits since 1978. 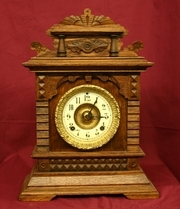 He teaches several classes on House Calls for both the Ohio and National clock trade organizations, WAO and AWCI. Almost 95% of the time we are able to complete an in home repair in one trip. Our house call rate is one of, if not the lowest house call price in Central Ohio. Mike will usually confirm a two hour time frame as to when he will arrive at your home keeping you from waiting all day wondering when the service man will show up. He is on time and on schedule almost 100% of the time. Herschede Tubular Bell floor clocks are sought after by serious collectors and by those who desire a clock of unusually high quality. Although not necessarily rare these clocks are seldom seen due to their size and cost. For the repairman it can be difficult to gain skill on these fine mechanisms since there are few who own them. Where as Mike has been able to repair thousands of certain clock types due to their commonality, since 1978 he has been privileged to set up, repair or restore over 150 Herschede Tubular Bell clocks. Herschede tubular bell clock movements are larger than most and are much more complicated. Mike even teaches a class on the restoration of these clocks for AWCI and WAO. See Herschede Restoration for more information. Moving and need some help with that large clock? I can pack your clock for a long distance move or even move it for you if you are moving within Central Ohio. I can also perform a set up of your floor clock if you have recently moved it. In most cases estimates are free. If you drop your clock of with us at our main location we will almost always be able to give you an estimate while you wait. A thorough explanation of the clock’s needs, an explanation of the work required, any repair options available and the cost to repair it will be given. After the dial and any ornaments are removed the clock case is thoroughly cleaned, and then a coat of lemon oil beeswax is applied when appropriate. Other case types can be rubbed out, polished and then waxed. Solid brass ornaments or bezels can be polished. Other ornaments such as feet and handles which are frequently made of cheap powdered metal and have lost their original finish can have a new finish applied if desired. See our Before and After page showing many examples of this work. Master Clock Repair is also able to handle most case refinishing projects. Many of our customers in need of extensive restoration like being able to get all of their clock needs accomplished in one place when possible. If your refinishing job is too difficult for us we will let you know. However we have obtained wonderful results for many of our customers who are thrilled when they see the completed clock. See our Before and After page showing many examples of this work. Several years ago I was called out to see a floor clock made in the 1920’s that had been damaged in a move. I wasn’t prepared for what I was to see. The clock case was in about 40 pieces and had this horrible green finish. The customer was considering trashing it. I told them there was hope. They agreed to let me complete the job, including case repair, case refinishing, movement restoration and new beveled glass. The customer was amazed! I only wish I had taken some pictures of the amazing transformation. Also, ask us about the large Howard Banjo #1 we completed recently. This clock had fallen off a wall, was in about ten pieces, had been poorly refinished, and all the original glass was missing. Not only did we restore the clock movement, we reassembled and refinished the case, had the pendulum stick re-gilded in real gold and the glasses custom painted to match original designs, including real gold leaf borders. Here at Master Clock Repair we perform many jobs for national and local fire service companies. These jobs can range from light cleaning and movement service to complete case and movement restoration including pick up and delivery. Many antique American clocks had paper dials glued onto metal dial pans. This was far cheaper than those that were painted on. The down side was that over time the paper dial would not only get very dirty but could also wear due to handling. Reproductions of these original dials are available and can be used to restore the original look of the clock for a fairly reasonable price. See the Before and After page for some examples of this type of work. We often see painted and silvered dials come through our shop that have been badly damaged due to misguided attempts at cleaning or repainting. Although we do not do this work ourselves we know who does and does it right. Within every aspect of clock restoration is someone who performs that task as a specialty. See examples on our Before and After page. Frequently the original reverse painted or stenciled glass is missing, broken or some of the picture has been inadvertently removed do to improper cleaning. Many reproduction stenciled glasses common on antique American kitchen clocks are available and some reverse painted glasses are available as well. It is also possible to have a custom reverse painted glass done for you. Although we do not do this work ourselves we know who does and does it right. Within every aspect of clock restoration is someone who performs that task as a specialty. For the most part battery operated movements are either not repairable or not worth repairing. However, in most cases, a new unit can be installed in place of the old one. Whether it is a time only unit, one that swings a pendulum or even one that chimes, replacement units are available for many different applications. When an older electric clock ceases to function more often than not the problem is that the motor that drives the mechanism has failed. Unfortunately, with the modern battery operated quartz clock units now available the electric clock has fallen out of favor with new product manufacturers. Consequently almost all of the motors for these older clocks are no longer available. Although there are a few that are commonly rebuilt, in many cases it becomes necessary to convert these older units either by installing another type of electric unit or by using the newer battery operated clock units. More often than not this conversion can be done in a way where there is no change or very little change that can be seen. Mike has converted hundreds and hundreds of these clocks and can do it for you as well. Bring it in and let Mike show you what he can do.